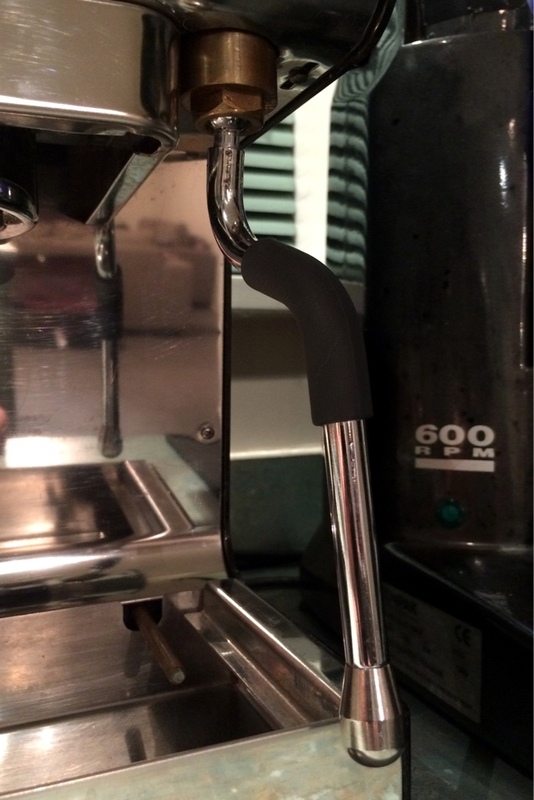 So a popular modification on the Gaggia Classic machine is to fit a steam wand from a V2 Rancilio Silvia, replacing the standard (and rubbish) panarello wand. Whilst this is a good, easy modification, you are still limited by the wand only moving side to side and not being a ball jointed wand. An option is to fit a wand from a V3 Silvia however this can be quite expensive and requires adapters to make it work on the original pipe fitting on the Classic. After pondering which route to take when refurbishing a Classic, I checked my spares bin and found a steam wand from a Sunbeam EM5900. The advantage of this wand is that it is a ball jointed wand with the swivel assembly enclosed in a brass case with a 1/4" male fitting on top. The wand is a perfect fit onto the original Classic fitting. All that is needed is to remove the original o-rings from inside the fitting (if they didn't come out when you removed the original wand), add some teflon tape to the male thread on the steam wand and attach it to the pipe fitting. Some bending of the copper pipe is required to fit the brass case of the wand inside the body of the machine. By bending the pipe to create some downward force on the wand, it is held firmly against the machine and does not move. Performance is great with this wand, it's a good match for the Classic. It is quite long but it is easy to fit a large milk jug under it. Purchasing one of these wands is difficult as there aren't really any spare part suppliers. You should be able to get a whole EM5900 fairly cheap though. I believe the EM6200 has the same wand although I'm not totally sure. Nicely done noidle. I've got a 5900 steam arm on my Simona Top. The initial upgrade I did was with a 6910 arm as that was all I was able to pick up at the time. But it didn't have the fitting with it so I had to do the best I could with a standard male/male adapter. It was never a good fit as the internal thread on the 6910 wand attachment is a seriously strange thread, as I'm sure you know. Over summer I spotted a 5900 arm on eBay for a good price that included the brass fitting. It turned out to be a perfect fit!! Woohoo! The best thing about the 5900 arm is that it's a better shape with a nicer curve. What I've also found is that the tip that is standard on both these arms pretty much sux. The best Sunbeam tip in my opinion is found standard on the 4820. It's a different shape and has a smaller hole. It worked much better on this setup, but admittedly I never had a chance to try it on a 6910. What I've done now is shove a Profitec 2-hole tip in there. (A 4 hole could work too if that's your thing). The threads are different, but are the same diameter and its holding well with a bit of help from some Loctite. Last edited by LeroyC; 31st May 2016 at 07:39 PM. where can i buy a machine like this one ? 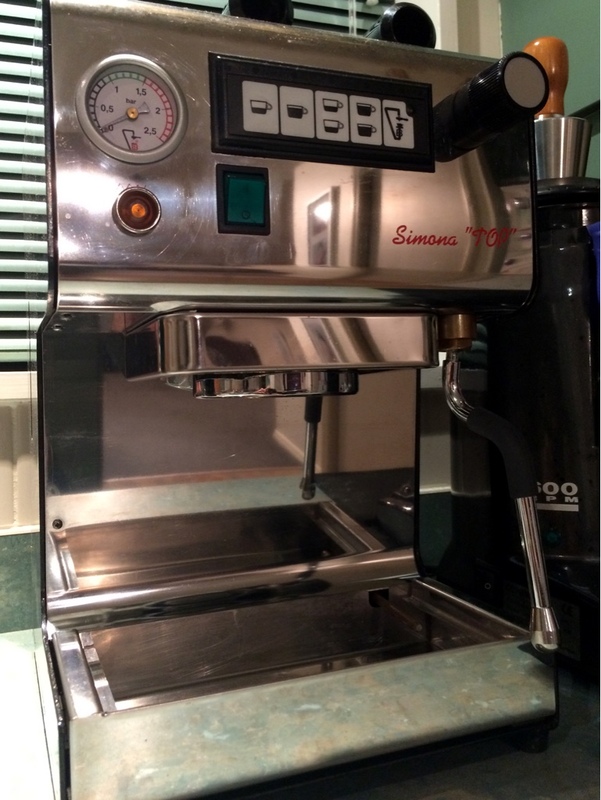 Can anyone point me out which one of these machine is the one you guys are talking about i dont see any model numbers on the post i m looking for an espresso machine for my day for fathers day and this one looks like the right one for him. I m in canada if anyone has a better place where i can buy the machine for a better price i would really appreciated thanks everyone hope to here from you guys soon. Hey mate and welcome. I just had a look at that website. It very much depends on what you're happy to spend so it's hard to make a recommendation. Of the ones there the two best options under US$1000 in my opinion are the Gaggia Classic and Gaggia MDF grinder combo, or the Lelit Anna and grinder combo. 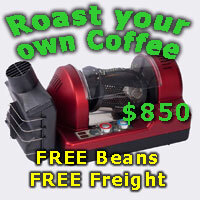 However as you're in North America you can buy from some of the worlds biggest online home espresso sellers such as Whole Latte Love and Seattle Coffee Gear. Chris Coffee is another one worth looking at. They all have online support so can talk to you about what you want and find a machine that fits your budget. I'd suggest you shop around and get some advice from some of these local retailers. Good luck. The best thing about the 5900 arm is that it's a better shape with a nicer curve. What I've also found is that the tip that is standard on both these arms pretty much sux. The best Sunbeam tip in my opinion is found standard on the 4820. It's a different shape and has a smaller hole. It worked much better on this setup, but admittedly I never had a chance to try it on a 6910. What I've done now is shove a Profitec 2-hole tip in there. That's a good idea. I too find the EM4820 steam tip to be well designed. As it happens I have many spare EM4820s so I nicked the steam tip off one and gave it a go on the Classic. It has made an improvement. I would like to fit a three hole tip from a Breville Dual Boiler however the thread pitch is different but the diameter appears the same. With a re-tapping of the steam wand thread, if it's possible, it might work. I'd just try it without re-tapping it and use some Loctite. I had an engineer look at mine to re-tap it to take the Profitec tip and he said there wasn't enough material to work with so that's what he recommended. Mine's worked a treat so far, I've even swapped the Profitec tip from the 6910 wand to the 5900 wand without any problems. Thank you guys I had little time left i settle for the Gaggia classic so it should be home on time, my tracking said by Monday i should get it! honestly thank you so much for all your help and input means a lot for me, my dad earn this and more his my hero I spend lots of time on this trying to get the right machine i hope i made the right choice. goodnight all.. It certainly is a good choice, I'm sure he will enjoy it. There's plenty of information on this forum and the internet in general regarding how to get the best from the machine as it does take a bit of getting used to. Do plenty of reading if you haven't already and you can teach your Dad how to make a great coffee. Don't suppose you've got a couple more 4820 steam tips you could spare? I'd love to get one or two and am happy to pay a fair price, just not the $50 each they want for new ones. Flick me a PM if you can help. Hi noidle, I came across a decently priced classic that I thought would make a good machine to throw in the boot when we go away and like the look of your mod. I don't have an EM5900 but have found a guy on gumtree that is willing to sell me just the wand from his shagged machine, just wondering if it's an easy job for your average bloke to get the wand off or if it will require significant disassembly? It's easy. You just need a shifting spanner or spanner set. It just unscrews. Thanks, I figured as much but you never know with these machines how convoluted it's going to be. No worries. I should've said you will probably need to 2 spanners. Correct size crescents are best but shifters will do. You'll be able to get the steam arm itself off on the outside of the machine, but you'll need the adapter fitting as well which may or may not come out with it, it depends which thread wants to undo first. If the fitting stays in there you'll probably have to get inside the machine to get it out. Being a Sunbeam there should only be different size Phillips screws to remove, but the bodies of these machines can be a bit fiddly to get apart sometimes. As the machine is being scrapped just get stuck in, don't be gentle as there'll be some clips and hooks on panels that you need to break to get it apart. I've probably made it sound harder than it is, it's really not too bad and you'll be fine. The conversion is easy, just need to be careful bending the copper pipe not to kink it. Getting the EM5900 apart is another story. A no. 2 philips driver is all you will need. Flip the machine upside down and remove all screws around the group head area. There is also some screws near the water tank area. Pull the steam knob off. The entire upper part of the machine will then come away from the chassis. Some wiring will get in the way but if the machine will be scrapped just cut them. If it doesnt come away, check that you got all the screws. With enough fiddling the upper part will be freed and you can access the steam wand assembly. I think the EM5900 is one of the most unpleasant machines to work on. So a customer gave me their old Cubika machine because they couldn't get a decent coffee out of it and couldn't be bothered with it anymore. Figured I'd mod the wand on this one as well. The Cubika is even smaller than the Classic so the EM5900 or a 6910 steam wand would look absurd. I trial fitted a 6910 hot water wand with a 4820 tip and it looks good and fits the machine well. Similar method to make the wand fit, bending the copper pipe to accomodate the new wand. I would say it's even easier than on the Classic, less bending to do. The Cubika has a tiny boiler, around 150ml i believe so steaming is pretty weak. The standard milk jug (250ml) that comes with the machine works well as the level of the milk can easily be reached by the small wand. Using a 600ml jug is possible but not easy and it didn't yield great results. I also fitted an OPV to the machine which fits nicely where the original safety valve was. The machine can make respectable coffee now and i think it looks pretty good as well. Nice work. Would the old style BES800 wand work better? Do you mean 800ES? If so, yes it would, however the thread is so bizarre on it that I've not found a suitable adapter yet. If you meant BES820, it would also be a good fit however I don't have a spare one at the moment and it has the same problem as the 800ES, a weird thread. My next conversion will be a BES870 wand I think, they're one of my favorites. Yeah sorry, 800ES is what I meant. You're right about that thread. Have you tried 3/8BSPP? I know 3/8BSPT doesn't work, but the fitter at my work put the male thread off that elbow fitting into a gauge recently and he reckoned it fit into a 3/8BSP gauge, but straight rather than tapered. Otherwise maybe M16 metric? Is the wand on the em3820 the same as the 4820?